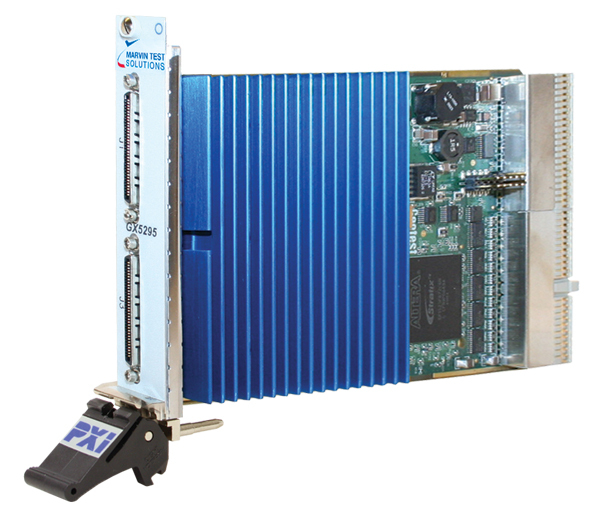 3U PXI High Performance Dynamic Digital I/O with PMU per Pin - GX5295 | Marvin Test Solutions, Inc. The GX5295 supports deep pattern memory by offering 256 MB of on-board vector memory with dynamic per pin direction control and with test rates up to 100 MHz. The board supports both Stimulus / Response and Real-time Compare modes of operation, allowing the user to maximize test throughput for go / no-go testing of components and UUTs that require deep memory test patterns. The single board design supports both master and slave functionality without the use of add-on modules. The GX5295’s pin electronic resources are independent on a per channel basis and include a full-featured PMU for DC characterization of DUTs. The PMU can operate in the force voltage / measure current or force current / measure voltage mode. In addition, the driver and receiver can be configured to support differential input and output signals from / to the UUT. A windowing method is utilized for memory accesses, which limits the required PCI memory space for each board to only 16 MB, thus preserving test system resources. A direct mode, for continuous data transfer between the test system controller and the I/O pins of the GX5295 is also supported. The GX5295 offers 256 MB of vector memory, with 64 Mb per channel. Programmable I/O width allows trading vector width for vector depth. Under software control, the GX5295’s vector memory can be configured to support channel widths of 32, 16, 8, 4, 2 and 1 with corresponding vector depths of 64 Mb, 128 Mb, 256 Mb, 512 Mb, 1024 Mb, and 2048 Mb. The GX5295 provides programmable LVTTL output clocks and strobes, and supports external clock and strobe. A programmable PLL (phase locked loop) provides configurable clock frequencies and delays. Additionally, 4 additional pin electronics resources are available for use as timing and/or control resources - providing programmable drive and sense levels from -2 to +7 V.
The GX5295’s sequencer can halt or pause on a defined address or loop through the entire memory as well as loop on a defined address range or through a defined block of memory. Two modes of digital test are also supported - a Stimulus / Response and a real-time compare mode. The Stimulus / Response mode is used for driving and capturing data. Alternatively, for digital tests requiring long test vectors, the real-time compare mode can be used to significantly shorten overall test times by comparing in real-time, expected test results and logging only failed vectors and resultant test results (pass or fail). The GX5295 is supplied with DIOEasy, which provides powerful graphical vector development / waveform display tools as well as a virtual instrument panel, 32-bit DLL driver libraries, and documentation. The virtual panel can be used to interactively control and monitor the instrument from a window that displays the instrument’s current settings and status. In addition, various interface files provide access to the instrument’s function library for programming tools and languages such as ATEasy, C/C++, Microsoft Visual Basic®, Delphi, and LabVIEW. Optionally, DtifEasy is available for use the GX5295. DtifEasy offers a complete LASAR post-processor and test execution environment for post-processing and executing of LASAR generated .tap files. Auxilary I/O Channels 4, can be used for timing / control functions. Auxiliary channels offer all features supported by the data channels including a PMU per channel without vector memory. Drive Data Timing Data valid relative to the rising edge of Clk0: 4 ns. Clock & strobe delays set to 0 ns. Data valid relative to the rising edge of EXCLK: 31 ns. Clock and strobe delays set to 0 ns. Clock and strobe delays set to 0 ns. Input Level LVTTL or programmable level using one of the four Aux pin electronics channels. Logic Levels LVTTL or programmable level using one of the four Aux pin electronics channels.